A moment's consideration of this case shows what a really great advance in the theory and practise of breeding has been obtained through the discovery of Mendel's law. What a puzzle this case would have presented to the biologist ten years ago! Agouti crossed with chocolate gives in the second filial generation (not in the first) four varieties, viz., agouti, chocolate, black and cinnamon. We could only have shaken our heads and looked wise (or skeptical). Then we had no explanation to offer for such occurrences other than the 'instability of color characters under domestication,' the 'effects of inbreeding,' 'maternal impressions.' Serious consideration would have been given to the proximity of cages containing both black and cinnamon-agouti mice. Now we have a simple, rational explanation, which anyone can put to the test. We are able to predict the production of new varieties, and to produce them. We must not, of course, in our exuberance, conclude that the powers of the hybridizer know no limits. The result under consideration consists, after all, only in the making of new combinations of unit characters, but it is much to know that these units exist and that all conceivable combinations of them are ordinarily capable of production. This valuable knowledge we owe to the discoverer and to the rediscoverers of Mendel's law. 'New Colour Variety of the Guinea Pig', Science, 1908, 28, 250-252. A weird happening has occurred in the case of a lansquenet named Daniel Burghammer, of the squadron of Captain Burkhard Laymann Zu Liebenau, of the honorable Madrucci Regiment in Piadena, in Italy. When the same was on the point of going to bed one night he complained to his wife, to whom he had been married by the Church seven years ago, that he had great pains in his belly and felt something stirring therein. An hour thereafter he gave birth to a child, a girl. When his wife was made aware of this, she notified the occurrence at once. Thereupon he was examined and questioned. … He confessed on the spot that he was half man and half woman and that for more than seven years he had served as a soldier in Hungary and the Netherlands… . When he was born he was christened as a boy and given in baptism the name of Daniel… . He also stated that while in the Netherlands he only slept once with a Spaniard, and he became pregnant therefrom. This, however, he kept a secret unto himself and also from his wife, with whom he had for seven years lived in wedlock, but he had never been able to get her with child… . The aforesaid soldier is able to suckle the child with his right breast only and not at all on the left side, where he is a man. He has also the natural organs of a man for passing water. Both are well, the child is beautiful, and many towns have already wished to adopt it, which, however, has not as yet been arranged. All this has been set down and described by notaries. It is considered in Italy to be a great miracle, and is to be recorded in the chronicles. The couple, however, are to be divorced by the clergy. As soon as the circumstances of an experiment are well known, we stop gathering statistics. … The effect will occur always without exception, because the cause of the phenomena is accurately defined. Only when a phenomenon includes conditions as yet undefined,Only when a phenomenon includes conditions as yet undefined, can we compile statistics. … we must learn therefore that we compile statistics only when we cannot possibly help it; for in my opinion, statistics can never yield scientific truth. From An Introduction to the Study of Experimental Medicine (1865), as translated by Henry Copley Greene (1957), 134-137. Every occurrence in Nature is preceded by other occurrences which are its causes, and succeeded by others which are its effects. The human mind is not satisfied with observing and studying any natural occurrence alone, but takes pleasure in connecting every natural fact with what has gone before it, and with what is to come after it. In Forms of Water in Clouds and Rivers, Ice and Glaciers (1872), 1. 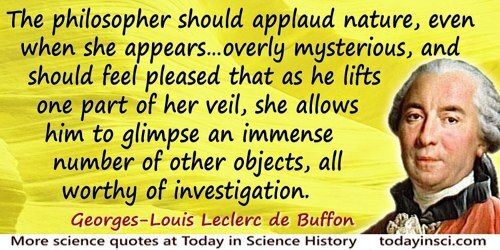 Far from becoming discouraged, the philosopher should applaud nature, even when she appears miserly of herself or overly mysterious, and should feel pleased that as he lifts one part of her veil, she allows him to glimpse an immense number of other objects, all worthy of investigation. For what we already know should allow us to judge of what we will be able to know; the human mind has no frontiers, it extends proportionately as the universe displays itself; man, then, can and must attempt all, and he needs only time in order to know all. By multiplying his observations, he could even see and foresee all phenomena, all of nature's occurrences, with as much truth and certainty as if he were deducing them directly from causes. And what more excusable or even more noble enthusiasm could there be than that of believing man capable of recognizing all the powers, and discovering through his investigations all the secrets, of nature! 'Des Mulets', Oeuvres Philosophiques, ed. Jean Piveteau (1954), 414. Quoted in Jacques Roger, The Life Sciences in Eighteenth-Century French Thought, ed. Keith R. Benson and trans. Robert Ellrich (1997), 458. Hope is a pathological belief in the occurrence of the impossible. In A Mencken Chrestomathy (1949, 1956), 617. How strange it would be if the final theory were to be discovered in our lifetimes! The discovery of the final laws of nature will mark a discontinuity in human intellectual history, the sharpest that has occurred since the beginning of modern science in the seventeenth century. Can we now imagine what that would be like? In Dreams of a Final Theory (1992), 235. I was sitting in a chair in the patent office at Bern when all of a sudden a thought occurred to me: “If a person falls freely he will not feel his own weight.” I was startled. This simple thought made a deep impression on me. It impelled me toward a theory of gravitation. Lecture in Japan (1922). The quote is footnoted in Michael White, John Gribbin, Einstein: a Life in Science (1995), 128, saying the talk is known as the 'Kyoto address', reported in J. Ishiwara, Einstein Koen-Roku (1977). If it were possible for us to have so deep an insight into a man's character as shown both in inner and in outer actions, that every, even the least, incentive to these actions and all external occasions which affect them were so known to us that his future conduct could be predicted with as great a certainty as the occurrence of a solar or lunar eclipse, we could nevertheless still assert that the man is free. Critique of Practical Reason (1788). In L. W. Beck (ed. & trans. ), Critique of Practical Reason and Other Writings in Moral Philosophy (1949), 204-5. In 'The Meaning of Causality in Physics' (1953), collected in Max Planck and Frank Gaynor (trans. ), Scientific Autobiography: and Other Papers (1949, 2007), 124. It’s a common occurrence in a forefront area of science, where the questions are tough and the measurements extremely difficult. You have different groups using different methods and they get different answers. You see it all the time, and the public rarely notices. But when it happens to be in cosmology, it makes headlines. As quoted in John Moble Wilford, 'Astronomers Debate Conflicting Answers for the Age of the Universe', New York Times (27 Dec 1994), C9. Mathematical studies … when combined, as they now generally are, with a taste for physical science, enlarge infinitely our views of the wisdom and power displayed in the universe. The very intimate connexion indeed, which, since the date of the Newtonian philosophy, has existed between the different branches of mathematical and physical knowledge, renders such a character as that of a mere mathematician a very rare and scarcely possible occurrence. In Elements of the Philosophy of the Human Mind (1827), Vol. 3, Chap. 1, Sec. 3, 184. Notwithstanding, therefore, that we have not witnessed of a large continent, yet, as we may predict the future occurrence of such catastrophes, we are authorized to regard them as part of the present order of Nature. Principles of Geology (1837), Vol. 1, 94. One of the main purposes of scientific inference is to justify beliefs which we entertain already; but as a rule they are justified with a difference. Our pre-scientific general beliefs are hardly ever without exceptions; in science, a law with exceptions can only be tolerated as a makeshift. Scientific laws, when we have reason to think them accurate, are different in form from the common-sense rules which have exceptions: they are always, at least in physics, either differential equations, or statistical averages. It might be thought that a statistical average is not very different from a rule with exceptions, but this would be a mistake. Statistics, ideally, are accurate laws about large groups; they differ from other laws only in being about groups, not about individuals. Statistical laws are inferred by induction from particular statistics, just as other laws are inferred from particular single occurrences. The Analysis of Matter (1927), 191. In Parallel Worlds: a Journey Through Creation, Higher Dimensions, and the Future of the Cosmos (2006), 136. 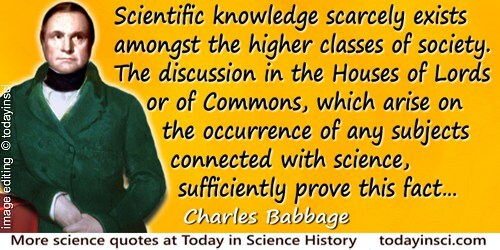 In Reflections on the Decline of Science in England (1830), 8. Statements about climate trends must be based on, er, trends. Not individual events or occurrences. Weather is not climate, and anecdotes are not statistics. In article, 'Dear Donald Trump: Winter Does Not Disprove Global Warming', on the Mother Jones website (2 Jan 2014). Spoken by fictional character, Charlie Chan, in Behind That Curtain (1928)', 47. The line also appears in the screenplay of the 1929 film adaptation with the same name. 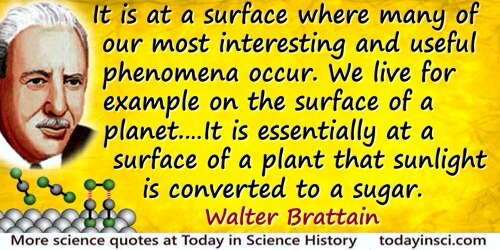 Subatomic particles do not exist but rather show “tendencies to exist”, and atomic events do not occur with certainty at definite times and in definite ways, but rather show “tendencies to occur”. In The Tao of Physics (1975), 133. The hypotheses which we accept ought to explain phenomena which we have observed. 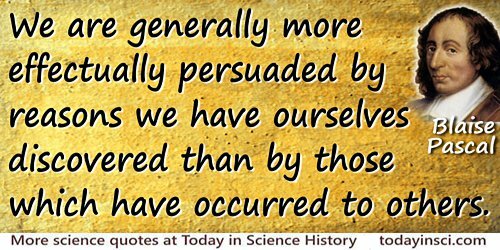 But they ought to do more than this; our hypotheses ought to foretell phenomena which have not yet been observed; ... because if the rule prevails, it includes all cases; and will determine them all, if we can only calculate its real consequences. Hence it will predict the results of new combinations, as well as explain the appearances which have occurred in old ones. And that it does this with certainty and correctness, is one mode in which the hypothesis is to be verified as right and useful. Philosophy of the Inductive Sciences (1847), Vol. 2, 62-63. The occurrence of an internal skeleton, in definite relations to the other organ systems, and the articulation of the body into homologous segments, are points in the general organization of Vertebrates to which especial weight must be given. This metameric structure is more or less definitely expressed in most of the organs, and as it extends to the axial skeleton, the latter also gradually articulates into separate segments, the vertebrae. The latter, however, must be regarded only as the partial expression of a general articulation of the body which is all the more important in consequence of its appearing prior to the articulation of the originally inarticulate axial skeleton. Hence this general articulation may be considered as a primitive vertebral structure, to which the articulation of the axial skeleton is related as a secondary process of the same sort. As translated and quoted in Ernst Haeckel and E. Ray Lankester (trans.) as epigraph for Chap. 11, The History of Creation (1886), Vol. 1, 328-329. The starting point of Darwin’s theory of evolution is precisely the existence of those differences between individual members of a race or species which morphologists for the most part rightly neglect. The first condition necessary, in order that any process of Natural Selection may begin among a race, or species, is the existence of differences among its members; and the first step in an enquiry into the possible effect of a selective process upon any character of a race must be an estimate of the frequency with which individuals, exhibiting any given degree of abnormality with respect to that, character, occur. The unit, with which such an enquiry must deal, is not an individual but a race, or a statistically representative sample of a race; and the result must take the form of a numerical statement, showing the relative frequency with which the various kinds of individuals composing the race occur. Biometrika: A Joumal for the Statistical Study of Biological Problems (1901), 1, 1-2. To throw in a fair game at Hazards only three-spots, when something great is at stake, or some business is the hazard, is a natural occurrence and deserves to be so deemed; and even when they come up the same way for a second time if the throw be repeated. If the third and fourth plays are the same, surely there is occasion for suspicion on the part of a prudent man. [In the case of research director, Willis R. Whitney, whose style was to give talented investigators as much freedom as possible, you may define “serendipity” as] the art of profiting from unexpected occurrences. When you do things in that way you get unexpected results. Then you do something else and you get unexpected results in another line, and you do that on a third line and then all of a sudden you see that one of these lines has something to do with the other. Then you make a discovery that you never could have made by going on a direct road. Quoted in Guy Suits, 'Willis Rodney Whitney', National Academy of Sciences, Biographical Memoirs (1960), 355.